A new TV show catering for gamers had recently debuted and The One wanted to hear from readers about what they thought of it. Did Gamesmaster provide what gaming fans were looking for? Electronic Arts were to publish "Castles", a "SimCity" meets RPG game from Interplay. A new book from Sigma sought to help players struggling to get to grips with adventure games. "The Adventure Gamer's Manual" would contain a mix of game specific and general adventuring tips. I actually found a copy of this in a local bookstore around 2000 - completely random. The highly anticipated next instalment in the "Bubble Bobble" series was heading to home computers. Ocean would be publishing the conversion of "Parasol Stars". Rather than having to break out, Inforgrames's "Alcatraz"would see the player having to raid the prison and take it back from terrorists. 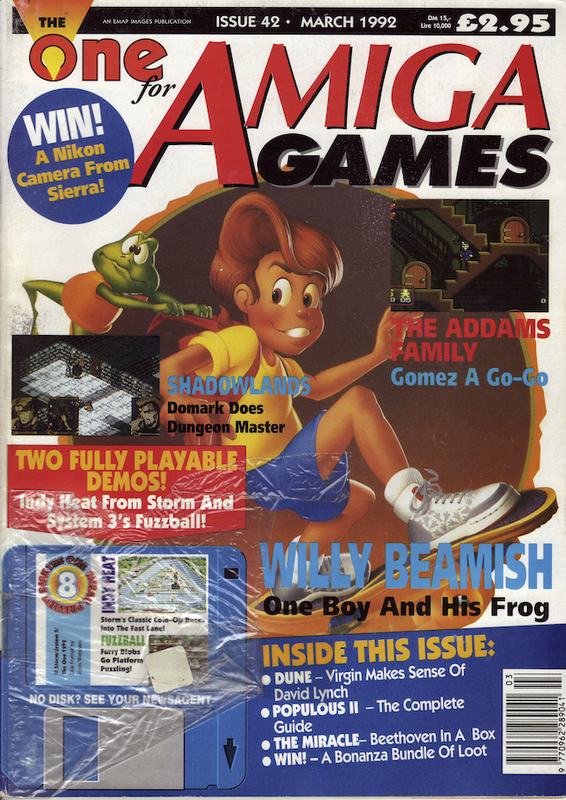 While Nintendo had Mario and Sega Sonic, the Amiga had yet to find a platformer mascot of its own. Would the upcoming "Titus the Fox" from French software house Titus fill that void? Core Design was working on not one but two racing games with the Jaguar license. "Jaguar XJ220 Sports Racing" would take place in 12 different countries, while the second would be based around the Le Mans 24 hour race. Both games were being programmed by Mark Avory, who had apparently also made good progress on a 3D vector racing engine (the two Jag games would be sprite based). Were we about to enter the golden period for Sensible Software? They revealed their next three games: "Wizkid", "Sensible Soccer" and "Cannon Fodder". All three rank amongst the greatest Amiga games ever made. The demise of Mirrorsoft the previous year left a lot of developers without a publisher. Some games were being transferred to Acclaim, but others were in limbo. One such title trying to find a home was Graftgold's rather excellent "Fire and Ice". Spielberg's "Hook" had been a hit at the box office and Ocean hoped that would translate into a big selling game. Infogrames struck a deal with Disney to bring Mickey Mouse, Donald Duck and the like to home computers. The first game up for release would star Roger Rabbit in "Hare Raising Havoc". The programmer behind "Switchblade 2" was working on an impressive looking platformer. "Zool" would see the player take on role of a ninja ant (yes, Gremlin's Ian Richardson described it as a "ninja ant") in colourful candy filled levels, and was expected to be on shelves sometime in the summer. Grandslam was going to have a crack at the rather crowded golf sim genre with "Nick Faldo's Golf". 200 exhibitors and 40,000 visitors were anticipated for the upcoming Spring Computer Shopper Show at Olympia in May. Joystick manufacturer Spectravideo were adding a few more models to its Logic3 range. Talking Birds, developer of "Football Tactician", promised a year of free update disks of all 440 players in the first division. The next subject to be tackled by sim specialist Maxis would be... ants. According to Jeff Braun, "SimAnt" was an "apology for "SimEarth"." Adventure game legend Fergus McNeill had turned his attention to spaghetti westerns with "Town With No Name", an FMV game for the CDTV. Hex, a team that had specialised in visuals for music videos, felt that games looked "sterile" and that their new technique of video sampling would remedy that in "Top Banana"... they certainly succeeded in producing something that could not be described as sterile. This game was examined in one of my favourite Amigos podcast episodes. Extra amusing as the programmer is an old workmate & friend. When one thinks of player characters, I doubt the role of a tomato comes to mind, but Psygnosis were doing that in the appropriately named"Tomato Game". Running a successful airline was the goal of biz sim "Air Bucks" from Impressions. The classic footie management game "Championship Manager" was about to debut. This month Al Lowe ("Leisure Suit Larry" etc) and Steve Turner ("Dragontorc", "Ranarama" etc) got the developer profile treatment. The One gave “The Miracle” - a piano tutor package complete with keyboard - from Mindscape a whirl. The verdict? The software was decent, but the keyboard wasn’t up to much - especially for £299. Games PR person Danielle “Woody” Woodyatt described her ideal compilation. The Art of Point-and-Click Adventure Games pre-orders are live! Diary of a Game: Part 1 - Wha' Happen?